Affluence in the United States refers to an individual's or household's state of being in an economically favorable position in contrast to a given reference group. While there are no precise guidelines or thresholds for what may be considered affluent, the United States Department of Commerce's Bureau of the Census does provide detailed statistical data on the economic state of America's population. Inherited wealth may help explain why many Americans who have become rich may have had a "substantial head start." In September 2012, according to the Institute for Policy Studies, "over 60 percent" of the Forbes richest 400 Americans "grew up in substantial privilege." Income, measured either by household or individual, is perhaps the most commonly used measure for whether or not a given entity may be considered affluent. The term's usage varies greatly depending on context and speaker. Both an upper middle class person with a personal income of $77,500 annually and a billionaire may be referred to as affluent. If the average American with a median income of roughly $32,000 ($39,000 for those employed full-time between the ages of 25 and 64) was used as a reference group, the upper middle class person with a personal income in the tenth percentile of $77,500 may indeed be referred to as affluent. If compared to an executive of the Fortune 500, however, the upper middle class person would be poor. Currently, marketing firms and investment houses classify those with household incomes exceeding $75,000 as mass affluent, while sociologist Leonard Beeghley identifies all those with a net worth of $1 million or more as "rich." The upper class is most commonly defined as the top 1% with household incomes commonly exceeding $525,000 annually, as of 2013. These two figures should be seen only as guidelines based upon the top 1% of a population because net worth exceeding $1 million may be increasingly inaccurate as an upper class indicator as the value of the dollar falls due to inflation. Nonetheless, according to the New York Times on July 22, 2014, the "richest 1 percent in the United States now own more wealth than the bottom 90 percent". 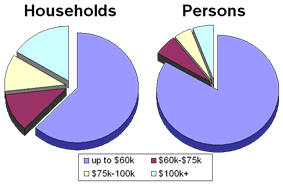 The U.S. Census Bureau offers income data by household and individual. 42 % of households have two income earners; thus making households' income levels higher than personal income levels. The share of married-couple families with children where both parents worked was 59.1 %. The 2005 economic survey revealed the income distribution for households and individuals whereby the top 5% of individuals had six figure incomes (exceeding $100,000) and the top 10% of individuals had incomes exceeding $75,000. The top 5% of households, three quarters of whom had two income earners, had incomes of $166,200 (about 10 times the 2009 minimum wage in the US) or more, with the top 10% having incomes well in excess of $100,000. The top 1.5% of households had incomes exceeding $250,000 with 146,000 households, the top 0.12%, having incomes exceeding $1,600,000 annually. Households may also be differentiated among each other, depending on whether or not they have one or multiple income earners. The high female participation in the economy means that many households have two working members. In 2005 for example, the median households income for a two income earner households was $67,000. The median income for an individual employed full-time with a graduate degree was in excess of $60,000, concluding that nearly half of those with graduate degree are able to out-earn most dual income households with one-income. The average home in the United States has more than 700 square feet per person, which is 50% - 100% more than in other high-income countries. Even in the lowest income percentiles people enjoy more space than middle classes in Europe. Likewise even in the lowest percentiles ownership rates of gadgets and amenities are exceptionally high compared to other countries. The labor market in the United States has attracted immigrants from all over the world and its net migration rate is among the highest in the world. Overall the term affluent may be applied to a variety of individuals, households or other entities depending on context. Data from the U.S. Census Bureau serves as the main guideline for defining affluence. U.S. government data not only reveals the nation's income distribution but also provides data regarding the demographic characteristics of those to whom the term, affluent, may be applied. Affluence and economic standing within society often are expressed in terms of percentile ranking. Economic ranking is conducted either in terms of giving lower thresholds for a designated group (e.g. 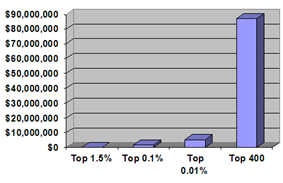 the top 5%, 10%, 15%, etc.) or in terms of the percentage of households/individuals with incomes above a certain thresholds (e.g. above $75,000, $100,000, $150,000, etc.). The table below presents 2006 income data in terms of the lower thresholds for the given percentages (e.g. the top 25.6% of households had incomes exceeding $80,000, compared to $47,000 for the top quarter of individuals). This graph shows the income of the given percentiles from 1947 to 2007, in 2007 dollars. Household income changes over the course of time, with income gains being substantially larger for the upper percentiles than for the lower percentiles. All areas of the income strata have seen their incomes rise since the late 1960s, especially during the late 1990s. The overall increase in household income is largely the result of an increase in the percentage of households with more than one income earner. While households with just one income earner, most commonly the male, were the norm in the middle of the 20th century, 42% of all households and the vast majority of married couple households now have two or more income earners. With so many present day households having two income earners, a substantial increase in household income is easy to explain. "The typical middle-class household in the United States is no longer a one-earner family, with one parent in the workforce and one at home full-time. Instead, the majority of families with small children now have both parents rising at dawn to commute to jobs so they can both pull in paychecks... Today the median income for a fully employed male is $41,670 per year (all numbers are inflation-adjusted to 2004 dollars)—nearly $800 less than his counterpart of a generation ago. The only real increase in wages for a family has come from the second paycheck earned by a working mother." – Elizabeth Warren, Harvard Magazine. Two income earner households are far more common among the top quintile of households than the general population. 2006 U.S. Census Bureau data indicates that over three quarters, 76%, of households in the top quintile, with annual incomes exceeding $91,200, had two or more income earners compared to just 42% among the general population and a small minority in the bottom three quintiles. As a result much of the rising income inequity between the upper and lower percentiles can be explained through the increasing percentage of households with two or more incomes. The vast majority of Americans derive the majority of their income from occupational earnings. Income derived from an occupation is largely determined by scarcity and the economic law of supply and demand. The more demand for a certain specialty and the less supply, the higher the income. There has been shown to be a correlation between increases in income and increases in worker satisfaction. The decrease in worker dissatisfaction, however, is not solely a result of the increase in income. Workers in more complex and higher level occupations tend to have attained higher levels of education and thus are more likely to have a greater degree of autonomy in the workplace. Additionally higher level workers with advanced degrees are hired to share their personal knowledge, to conceptualize, and to consult. Higher-level workers suffer less job alienation and reap not only external benefits in terms of income from their jobs, but also enjoy high levels of intrinsic motivation and satisfaction. Physician (M.D. and D.O.) compensation ranks as the highest median annual earnings of any profession. Median annual earnings ranged from $156,010 for family physicians to $321,686 for anesthesiologists. Surgeons post a median annual income of $282,504. However, the annual salary for Chief Executive Officer (C.E.O.) is projected quite differently based on source: Salary.com reports a median salary of $634,941, while the U.S. Department of Labor in May 2004 reported the median as $140,350. This is primarily due to a methodological difference in terms of which companies were surveyed. Overall annual earnings among the nation's top 25 professions ranged from the $70,000s to the $300,000s. In addition to physicians, lawyers, physicists, and nuclear engineers were all among the nation's 20 highest paid occupations with incomes in excess of $78,410. Educational attainment plays a major factor in determining an individual's economic disposition. Personal income varied greatly according to an individual's education, as did household income. Incomes for those employed, full-time, year-round and over the age of twenty-five ranged from $20,826 ($17,422 if including those who worked part-time) for those with less than a ninth grade education to $100,000 for those with professional degrees ($82,473 if including those who work part-time). This median income for individuals with doctorates was $79,401 ($70,853 if including those who work part-time). These statistics reveal that the majority of those employed full-time with professional or doctoral degrees are among the overall top 10% (15% if including those who work part-time) of income earners. Of those with a master's degree, nearly 50% were among the top quarter of income earners (top third if including those who work part-time). 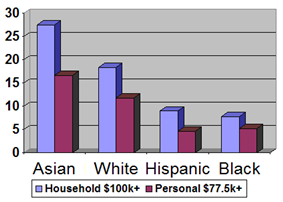 Racial breakdown of households making over $100,000 per year. Recent U.S. Census Bureau publications indicate a strong correlation between race and affluence. In the top household income quintile, households with incomes exceeding $91,200, Asian Americans and Whites were overrepresented, whereas Hispanics and African Americans were underrepresented. The household income for Asian Americans was, at $61,094, by far the highest, exceeding that of Whites ($48,554) by 26%. Over a quarter, 27.5%, of Asian American households had incomes exceeding $100,000, and another 40% had incomes of over $75,000. The racial breakdowns of income brackets further illustrate the racial disparities associated with affluence. in 2005, 81.8% of all 114 million households were White (including White Hispanics), 12.2% were African American, 10.9% were Hispanic and 3.7% were Asian American. While White households are always near the national median due to Whites being the by far most prevalent racial demographic, the percentages of minority households with incomes exceeding $100,000 strayed considerably from their percentage of the overall population. Asian Americans, who represent the smallest surveyed racial demographic in the overall population, were the found to be the prevalent minority among six figure income households. Among the nearly twenty million households with six figure incomes, 86.9% were White, 5.9% were Asian American, 5.6% were Hispanic and 5.5% were African American. Among the general individual population with earnings, 82.1% were White, 12.7% were Hispanic, 11.0% were African American and 4.6% were Asian American. Of the top 10% of income earners, those nearly 15 million individuals with incomes exceeding $77,500, Whites and Asians were once again over-represented with the percentages of African Americans and Hispanics trailing behind considerably. Of the top 10% of earners, 86.7% were White. Asian Americans were the prevalent minority, constituting 6.8% of top 10% income earners, nearly twice the percentage of Asian Americans among the general population. Hispanics, who were the prevalent minority in the general population of income earners, constituted only 5.2% of those in the top 10%, with African Americans being the least represented with 5.1%. 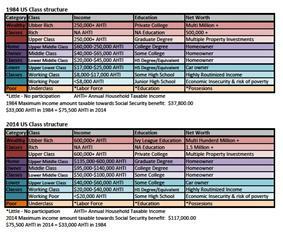 Charts comparing class structure in the United States between 1984 and 2014. Sources: Department of Labor Statistics (2014). Gilbert, D. (2002) The American Class Structure: In An Age of Growing Inequality. Belmont, CA: Wadsworth; Thompson, W. & Hickey, J. (2005). Society in Focus. Boston, MA: Pearson, Allyn & Bacon; Beeghley, L. (2004). The Structure of Social Stratification in the United States. Boston, MA: Pearson, Allyn & Bacon. The upper middle class may also be referred to as "Professional class" Ehrenreich, B. (1989). The Inner Life of the Middle Class. NY, NY: Harper-Colins. Economic well-being is often associated with high societal status, yet income and economic compensation are a function of scarcity and act as only one of a number of indicators of social class. It is in the interest of all of society that open positions are adequately filled with a competent occupant enticed to do his or her best. As a result, an occupation that requires a scarce skill, the attainment of which is often documented through an educational degree, and entrusts its occupant with a high degree of influence will generally offer high economic compensation. The high income is meant to ensure that the desired individuals obtain the necessary skills (e.g. medical or graduate school) and complete their tasks with the necessary valor. 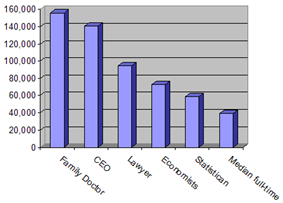 Differences in income may, however, be found among occupations of similar sociological nature. The median annual earnings of a physician were in excess of $150,000 in May 2004, compared to $95,000 for an attorney. Both occupations require finely tuned and scarce skill sets and both are essential to the well-being of society. Yet, physicians out-earned attorneys and other upper middle class professionals by a wide margin as their skill-sets are deemed especially scarce. Overall, high status positions tend to be those requiring a scarce skill and are therefore commonly far better compensated than those in the middle of the occupational strata. It is important to note that the above is an status and whether or not an individual may be referred to as affluent. In contemporary America it is a combination of all these factors, with scarcity remaining by far the most prominent one, determine a person's economic compensation. Due to higher status professions requiring advanced and thus less commonly found skill sets (including the ability to supervise and work with a considerable autonomy) are better compensated through the means of income, making high status individuals affluent, depending on reference group. While the two paragraphs above only describe the relationship between status and personal income, household income is also often used to infer status. As a result, the dual income phenomenon presents yet another problem in equating affluence with high societal status. As mentioned earlier in the article 42% of households have two or more income earners, 76% of households with six figure incomes have two or more income earners. Furthermore people are most likely to marry their professional and societal equals. It therefore becomes apparent that the majority of households with incomes exceeding the six figure mark are the result of an economic as well as personal union between two economic equals. Today, two nurses, each making $55,000 a year, can easily outearn a single attorney who makes the median of $95,000 annually. Despite household income rising drastically through the union of two economic equals, neither individual has advanced his or her function and position within society. Yet the household (not individual) may have become more affluent, assuming an increase in household members does not off-set the dual-income derived gains. As of 2002, there were approximately 146,000 (0.1%) households with incomes exceeding $1,500,000, while the top 0.01% or 11,000 households had incomes exceeding $5,500,000. The 400 highest tax payers in the nation had gross annual household incomes exceeding $87,000,000. Household incomes for this group have risen more dramatically than for any other. As a result, the gap between those who make less than one and half million dollars annually (99.9% of households) and those who make more (0.1%) has been steadily increasing, prompting The New York Times to proclaim that the "Richest Are Leaving Even the Rich Far Behind." The income disparities within the top 1.5% are quite drastic. While households in the top 1.5% of households had incomes exceeding $250,000, 443% above the national median, their incomes were still 2200% lower than those of the top 0.01% of households. One can therefore conclude that almost any household, even those with incomes of $250,000 annually, are poor when compared to the top 0.1%, who in turn are poor compared to the top 0.000267%, the top 400 taxpaying households. ^ "US Census Bureau, personal income distribution, 2005". Archived from the original on 14 December 2006. Retrieved 2006-12-11. ^ "US Census 2005 Economic Survey, income data". Archived from the original on 30 June 2006. Retrieved 2006-06-29. ^ ed.-in-chief: Paul Procter (1995). Cambridge International Dictionary of English. Cambridge: Cambridge University Press. ^ Bruenig, Matt (March 24, 2014). "You call this a meritocracy? Why rich inheritance is poisoning the American economy". ^ a b c d e f g h i j "US Census Bureau, personal income distribution, age 25+, 2006". Retrieved 2006-12-28. ^ a b "US Census Bureau, income distribution of individuals, employed full-time, year round, age 25–64, 2006". Retrieved 2006-12-27. ^ a b Ehrenreich, Barbara (1989). Fear of Falling, The Inner Life of the Middle Class. New York, NY: Harper Collins. ^ a b c d e f Thompson, William; Joseph Hickey (2005). Society in Focus. Boston, MA: Pearson. ^ Kristof, Nicholas (July 22, 2014). "An Idiot’s Guide to Inequality". ^ a b c d "US Census Bureau, income quintile and top 5% household income distribution and demographic characteristics, 2006". Archived from the original on 4 January 2007. Retrieved 2006-12-28. ^ a b c d "US Census Bureau, overall household income distribution, 2006". Archived from the original on 4 January 2007. Retrieved 2006-12-28. ^ a b "New York Times quote, households with incomes of over 1.6 million". Archived from the original on 31 December 2006. Retrieved 2006-12-28. ^ a b c d "Middle income can't buy Middle class lifestyle". Archived from the original on 29 December 2006. Retrieved 2006-12-28. ^ Robert E. Rector and Kirk A. Johnson, Ph.D. (January 5, 2004). "Understanding Poverty in America"
^ Robert Rector (August 27, 2007). "How Poor Are America's Poor? Examining the "Plague" of Poverty in America"
^ a b c "Income and poverty since 1967, US Census Bureau". Archived from the original on 26 September 2006. Retrieved 2006-09-26. ^ "Table F-1. Income Limits for Each Fifth and Top 5 Percent of Families (All Races): 1947 to 2007". Current Population Survey, Annual Social and Economic Supplements. ^ a b "US Census Bureau, income quintilea and Top 5 Percent, 2004". Archived from the original on 4 January 2007. Retrieved 2006-12-27. ^ a b c Eichar, Douglas (1989). Occupation and Class Consciousness in America. Westport, Connecticut: Greenwood Press. ^ a b "US Department of Labor, annual earnings for doctors". Archived from the original on 28 December 2006. Retrieved 2006-12-27. ^ "Salary.com". Archived from the original on 6 February 2009. Retrieved 2009-02-22. ^ "US Department of Labor, CEO salaries". Archived from the original on 22 December 2006. Retrieved 2006-12-27. ^ a b c "Bureau of Labor statistics data published by Monster.com, 20 highest paying jobs". Archived from the original on 27 December 2006. Retrieved 2006-12-27. ^ "US Department of Labor, median income of Economists". Archived from the original on 28 December 2006. Retrieved 2006-12-27. ^ "US Department of Labor, median income of Mathematicians". Archived from the original on 28 December 2006. Retrieved 2006-12-27. ^ "US Department of Labor, median income of financial managers". Archived from the original on 16 December 2006. Retrieved 2006-12-27. ^ "US Department of Labor, median income of Software Publishers". Archived from the original on 25 December 2006. Retrieved 2006-12-27. ^ "US Census Bureau, personal income for full-time, year round employed employed workers, age 25+". Retrieved 2006-12-28. ^ a b c "US Census Bureau, household income distribution for Asians, 2006". Retrieved 2006-12-29. ^ a b c d "US Census Bureau, household income distribution for Whites". Retrieved 2006-12-29. ^ "US Census Bureau, household income distribution for Whites, 2006". Retrieved 2006-12-29. ^ a b c "US Census Bureau, household income distribution for African Americans". Retrieved 2006-12-29. ^ a b c "US Census Bureau, household income distribution for Hispanics, 2006". Retrieved 2006-12-29. ^ a b c "US Census Bureau, personal income distribution for Asian Americans, 2006". Retrieved 2006-12-29. ^ a b c "US Census Bureau, personal income distribution for Whites, 2006". Retrieved 2006-12-29. ^ a b c "US Census Bureau, personal income distribution for Hispanics, 2006". Retrieved 2006-12-29. ^ a b c "US Census Bureau, personal income distribution for African Americans, 2006". Retrieved 2006-12-29. ^ "US Census Bureau, overall households income distribution to $100,000, 2006". Archived from the original on 30 December 2006. Retrieved 2006-12-29. ^ "US Census Bureau, Personal income, age 25+, 2006 statistics forum". Archived from the original on 4 January 2007. Retrieved 2006-12-17. ^ a b c Levine, Rhonda (1998). Social Class and Stratification. Lanham, MD: Rowman & Littlefield. ^ "US Department of Labor, median income of registered nurses". Archived from the original on 2 January 2007. Retrieved 2007-01-02. ^ "The New York Times, Richest Are Leaving Even the Rich Far Behind". 2005-06-05. Retrieved 2007-01-02. Frank, Robert L. (2007). Richistan: A Journey Through the American Wealth Boom and the Lives of the New Rich.